Hall of the Great Buddha, Todaiji, Nara. c. 750 C.E., reconstructed 1709. Known as the largest wooden structure in the world. 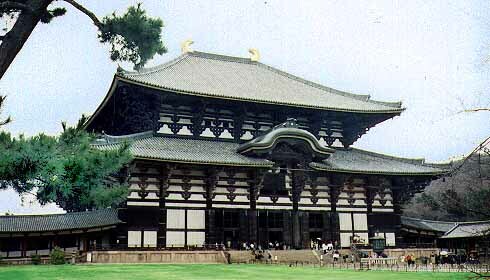 Todaiji, Buddhism, temple, roof, statue, bronze, gold, wood, east, largest, visit, spring, grass, deer, Nara. Religion, sightseeing, history, architecture, geography. Descriptions, comparisons (ichiban ~), dates.